Owning a gated community is a responsibility that we at Permacast know you take very seriously. One of the main benefits for your homeowners is that they live in a safe, protected environment. In order to provide the best security, you need to know where you are most vulnerable. Here are the places that your gated community is most vulnerable to intruders. Right off the bat, the first place you should make sure is secure is the gate itself. Living in a gated community is not secure if the gate is not in top condition. Make sure you regularly check the lock or electronic system that operates your gate. Do not leave things to chance, and make sure that it is top priority when it comes to maintenance. Choose a gate that is sturdy, and does not allow intruders to slip through. When creating the structure for the gate, make sure it is flush to the wall surrounding the community, or at least is unable to be maneuvered through. One of the biggest risks you have is your own residents. Make sure that all residents are given a tour and briefed on safe behavior when they move in. Teach them how to properly access and close the gate. Let them know how to spot unusual activity. A community that is informed plays a big role in the safety of its members. Having a fence that is sturdy, durable, and secure is essential to the safety of your gated community. Make sure that the height is not easily scaled. Invest in long-term reliability, rather than quick and easy. A concrete or cement fence is best, but there is a difference in product quality. Many types of fences start to deteriorate and crumble over time, leaving you vulnerable. Opt for a fence that will endure weather, time, and other eroding factors. For a secure gated community, it is highly recommended that you have security systems and employees in place. However, this can easily become a vulnerable area if you aren’t careful. Make sure to always request background checks, and when possible, use a security company with a good reputation, a proper training program, and plenty of references. If you are using security equipment, opt to go with a professional instead of ordering your own. Their installation experts are trained to know exactly where to put surveillance equipment, and will make sure no spot is left open to potential vulnerability. 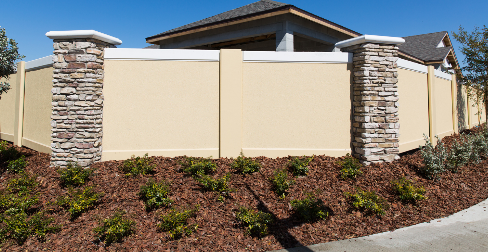 If you want the utmost in security, contact Permacast to inquire about our cement fencing.